Weatherwise around the world, this last weekend of September delivered a sneak preview of what each of us will likely enjoy or endure over the six months. We’re not fully into winter or summer yet, but the scent is in the air. Most of the birds you see these days, however, won’t be sticking around long, so take advantage while you can! On my nature rambles this weekend, I ran into a couple of White-crowned Sparrows. Anytime I see these dapper birds, they are automatically my best birds of the weekend (even if they turn up midweek.) Corey was disappointed to dip on a Lark Bunting out on Long Island this Saturday, a bird that not only would have been a state bird but also a lifer. 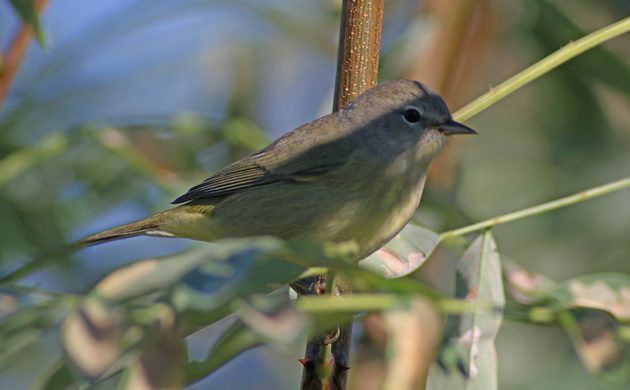 He had better luck on Sunday, seeing a host of autumn migrants including his Best Bird of the Weekend, an Orange-crowned Warbler at the Queens Botanical Garden that he spotted just before the New York City Audubon bird walk he led. Sadly, the bird did not reappear for the folks on the walk. No Orange-crowneds for me but lots of other good birds during a weekend of guiding in southern Costa Rica. Several key year birds and two country birds. My best/favorite was Sapphire-throated Hummingbird for the very close looks it gave. My first ever Baird’s Sandpiper certainly set the tone for the weekend, but there was aslo a huge surprise. While sitting near a flooded field, enjoying dozens of migrant ducks and shore birds, a lone Greater White-fronted Goose circled and landed right in front of me! This is my seond White-fronted ever here on the southern end of the Baja.